A first glance, the bike looks really nice.The appearance is as sharp as a hawk. The color is bright with red and white, which is dynamic. Besides, it has clean lines that I desperately want to have a ride. I noticed that it has inverted forks which is not equipped on most of the Chinese off-road bikes. I can’t wait to try them and check if it is good or not. When sitting on it, I was welcomed by all the usual equipment. I moved the bike around and noted that it was not the heaviest although you can feel the weight of the engine and all the steel rather than alloy components that you find on a Japanese or European bike. The rear swing arm is made up of steel and it ensures high strength although it’s a little heavy. The bike starts up easily from cold condition. This is due to the new fuel injection system on the bike which means better fuel economy. It is equipped with a standard 1 down 5 up gearbox. The gearbox changes smoothly. The clutch had good transition when starting and it was easy to run through all the gears on the bike. The manufacturer installs an oxygen sensor to collect the emission data. This shows the effort of the manufacturer for environmental protection. 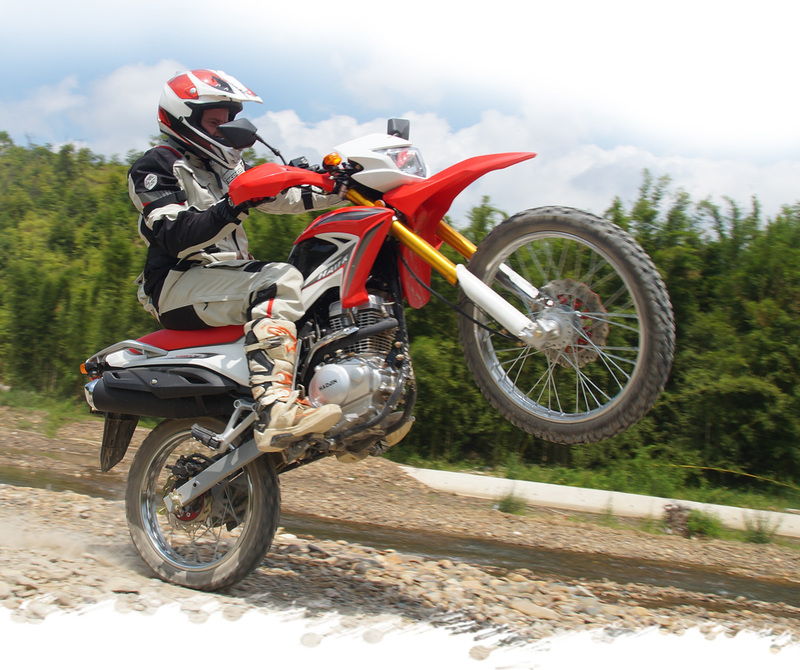 The engine is powerful enough to allow you to do awheelie jump without a problem. Its rapid acceleration and remarkable endurance shine through your riding. The power is enough that when you come to a big lump or bump in the road or track. You can lean back and blip the throttle to make the front end skip over the bump or rock etc. For a 200 cc engine it has quite reasonable power on the road. You can comfortably ride along at about 85 kph. The bike will do a top speed of about 110 kph which is not that fast but when you are on the road getting between trails it is plenty of speed to cool down a bit and take a breath before you hit the next trail. While riding it on the road I had to remind myself that it was only a 200 cc. It had good acceleration and it felt more like it was 300cc. The transmission ratio of this bike is set for large torque output. It provides larger torque despite lower maximum speed. When it reaches the maximum speed, the torque is still very large. For off road, the transmission system seems perfect. 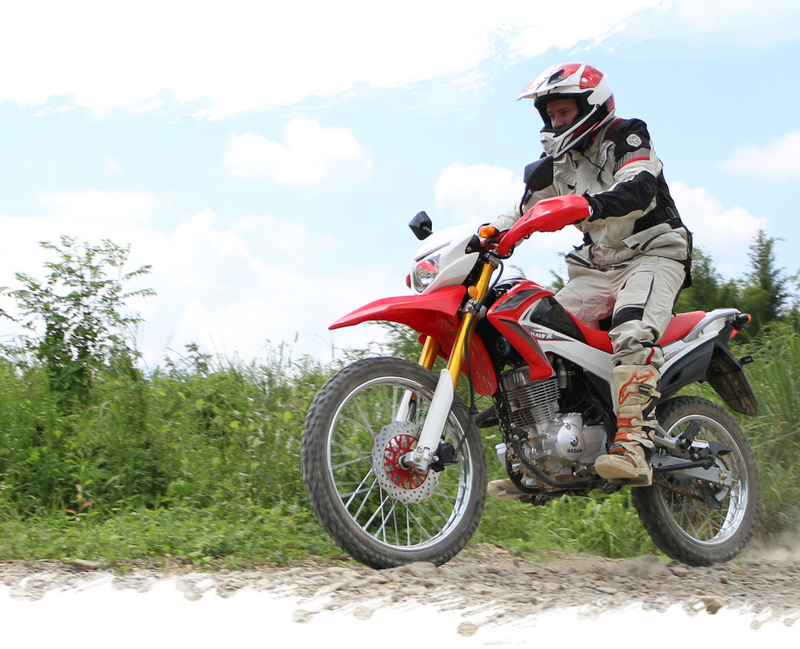 Besides, the 110kph maximum speed is not bad in off-road bikes. Of course, the rear chain wheel is able to be replaced with a smaller one to easily get a higher speed. This bike is equipped with an inverted front damper which is a booster for this bike with golden color and stronger and widened cylinder. This damper is very sturdy and durable and gives good feedback not like other bikes I’ve ridden. The front of the bike is quite light. When you push the forks hard, they also can handle the pace although the diameter of the fork versus the weight of the bike makes them flex a bit when you start to ride faster. They don’t feel clunky either. They are nice and plush, therefore, I had a good feeling right throughout their stroke.When I rode the bike up a rocky river, the bike is a bit heavy but the front suspension did a great job of soaking up all sizes of rocks.If I have to point out the shortcomings of the suspension, the spring of the rear suspension is relatively stiff according to my experiences. HAWK’s max handle turning angle is 43°. The min turning radius is 2.0m. The max climbable gradient is 35°. 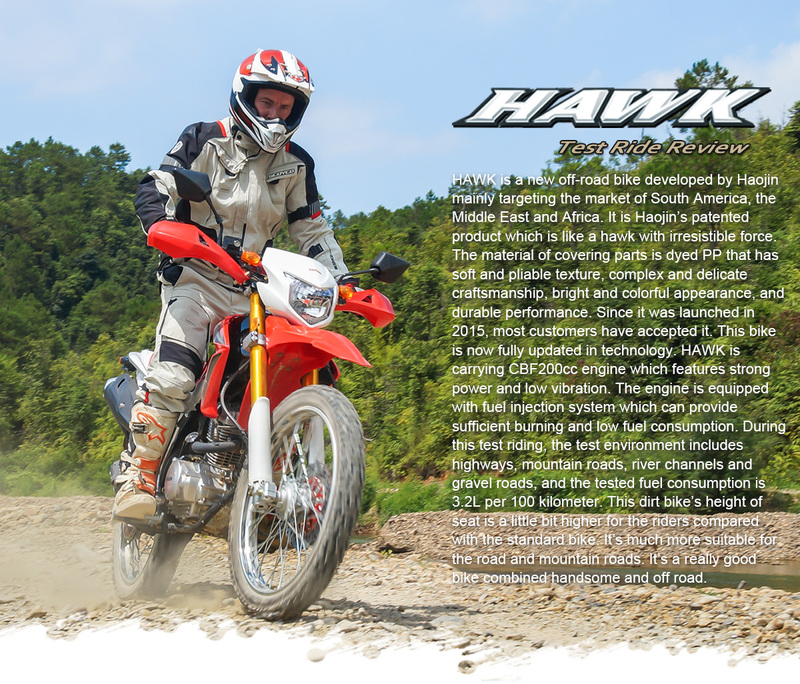 Moreover, the anti-twist steel frame helps HAWK easily conquer the wild environment.The tires are the high teeth tires which offer high road-holding capacity and run-through ability, befitting on-road and off-road conditions. I first rode the bike on the tar seal road, both the front and the rear brakes felt well. 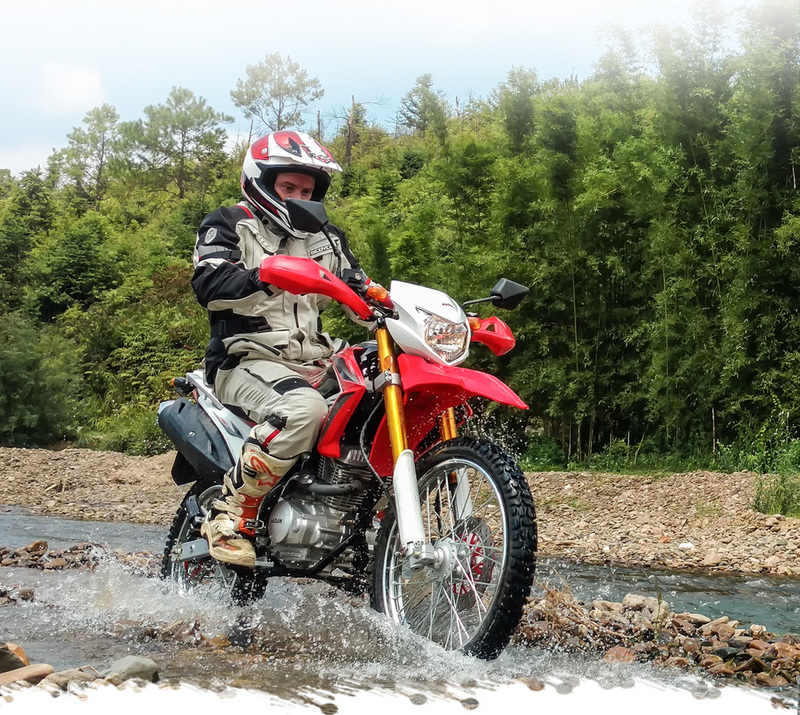 They can easily bring the bike to a stop even in an emergency situation where you need to stop quickly.The front brakes are good for both off road and on the road. They have a good progressive feel to them and have more than enough stopping power. The bike doesn't feel too wide when you sit on it and the height was good for me. The seat is smoothly outlined, slip-resistant and it is ergonomically designed to comfort your drive.The handle bars are a good width. All the controls feel great, only the front brake is too flexible. The Speedo I found worked well but I feel it could do with being angled back a little more towards the rider so you can get a better view. The indicator, high and low beam and the horn switches all seemed to work without problems. Bionically designed with shape like a falcon, HAWK reflects the vigor only belongs to the strong – the fashionable stickers, windage-cutting decoration covers and the muscular lines and curves are best explanation. The inverted forks also give the bike a modern up-to-date look. All the controls are well laid out and easy to use. The indicators are reasonably modern and are tucked into the bike enough that if you dropped the bike they would not get broken. The Speedo is fairly simple but has enough information and looks quite modern. So what's good about this bike is that the front forks are really great a big change from conventional forks and they really lighten up the front of the bike.The bike looks extremely modern and the graphics are simple and pleasing to the eye.Meanwhile,the engine has a good usable amount of power for the amount of cc and for the beginner rider it is a really user friendly bike that has enough power when you need it but is tame enough for the beginner that has no experience at all .The front brakes are good and work well. I have nice feel to them. The bad points are the rear brake is too flexible. The bike’s fuel injection system is not perfect for fuel saving but it’s more important for it to ensure the safety as an off-road bike. This needs more power output and fuel consumption. 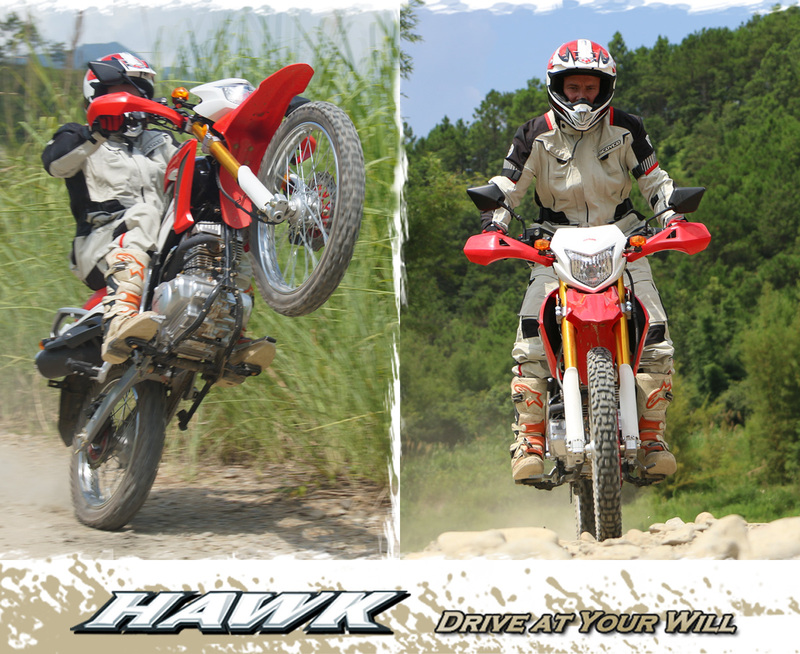 Overall I think HAWK is a great little bike for someone wanting to ride on the road and do a little bit of off road for fun. I wish I could have spent a little more time riding it off road in some more gnarly track to see how it could climb. I am sure it will just chug up the hills with ease . It will let you ride all day long without any problem and it is comfortable sitting on about 85-90 kph on the road. You can also take a passenger without any problem as it has a set of rear pegs and there is plenty of room on the back. A few small things need some adjustment which I did not have the time to do and the bike will be a lot nicer and more comfortable to ride. For the price of this bike I think it is really great value and is a great bike to get you into the great outdoors without the huge expense.The front brakes are good and work well. I have nice feel to them.The bad points are the rear brake is too flexible. The bike’s fuel injection system is not perfect for fuel saving but it’s more important for it to ensure the safety as an off-road bike. This needs more power output and fuel consumption.